We can reduce our risk of cancer or cancer recurrence by making healthy choices in our diet and by maintaining a healthy weight. I always encourage my patients to eat a wide variety of foods from all food groups: fruits, vegetables, lean protein, low-fat dairy and whole grains. I love this recipe, created by Ochsner’s executive chef Marc Gilberti, because it does just that! These street tacos include all 5 food groups wrapped up in a warm tortilla. One taco has around 250 calories, 15g protein, 4g fiber, no added sugar, and lots of flavor. Healthy eating doesn’t have to be boring and bland. 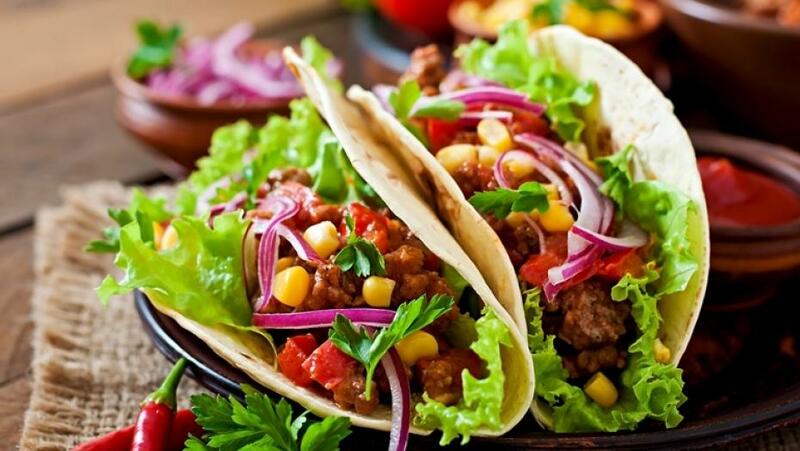 The best thing about this taco is the opportunity you have to make it yours! Change it up by adding your favorite lean protein, like shrimp or fish, or your favorite salsa and toppings. Choose fruits and vegetables that are in season for better taste, cheaper price, and higher nutritional value. Chicken Mixture: In a medium Teflon skillet, heat oil to a medium heat. Add onions and garlic and sauté for 2-3 minutes or until translucent. Add chicken, cumin, green onions and salt and pepper to taste. Saute for 4-5 minutes or until chicken mixture is hot. Red Cabbage Slaw: Combine all ingredients 15 minutes prior to preparing tacos. Corn Salsa: Combine all ingredients and marinate for at least 1 hour. Taco Assembly: Heat tortillas in microwave or skillet. Place ½ cup of red cabbage slaw in middle of tortilla, add ½ cup shredded chicken mixture and top with ¼ cup corn salsa and a sprinkle of queso fresco. Serve. Learn more about our resources for cancer patients here.